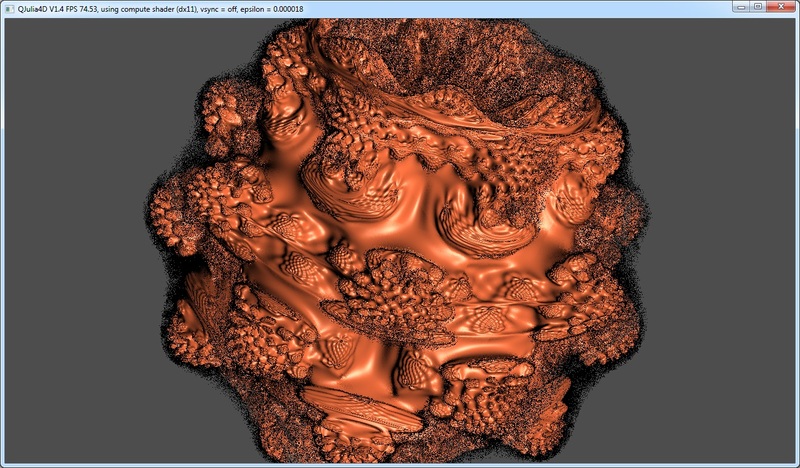 Hey I am a fractal newbie, but I found the http://www.skytopia.com/project/fractal/mandelbulb.html and I love it! As an exercise in programming (and possible stupidity) I would like to write my own renderer (in OpenCL). I took a look at David Makin's Distance Estimator and I understand most of it except the test " if binary search count>=max binary depth". It seems "binary search count" is only set to 0 or 1. Does this get incremented elsewhere? Can I get some clarification? Apologies if I missed it, but yes the binary search count should be incremented at each binary step and the search should continue either for a preset maximum number of steps or until the new step distance is less than a given min search value or until the difference between the estimate and the threshold is less then a given min search value. where |z| is actually the square of the magnitude and @bailout is the bailout value this is tested against - we avoid using sqrt by testing the square and avoid using the square root in the smooth iteration calculation by using 0.5*log(). Whether or not a +1 is required in the above for a positive mu depends on how the iteration count is implimented in the formula but for mu to always be positive then n should be at least 1 i.e. bailout on the first iteration should have a count of 1 - this is irrelevant for the delta DE however since the +1's from the two positions on the ray would simply cancel out i.e. for that as far as the n's are concerned it's only their relative value that matters. For z^2+c in the above divergence would be 2 and in fact if using a fixed constant for divergence then the log(0.5*log(@bailout)) term is irrelevant for the delta DE calculation. The above method however has small errors at iteration boundaries specifically due to the fact that we're bailing out before the magnitude reaches infinity. In 2D these errors only really show in formulas with non-integer divergence and more especially in formulas where the divergence actually varies across the fractal however the delta DE method is more sensitive to the errors. where penultimate z is the value from the iteration prior to the bailout iteration - usually called zold in complex formulas, note again that |value| here is used as the square of the magnitude to avoid the square root calculation. if using the variable divergence then the log(0.5*log(@bailout)) term must be included in the calculation of the values of mu. i have found the binary search to add more noise, since even with just 8 iterations the surface is extremely convoluted, perhaps to the limit of single precision floating point. for more than 8 iterations and/or using binary search, i'd say double precision is an absolute must. the other thing is that instead of using constant steps + binary search, it is perhaps more prudent to use unbounding spheres to ray march - this is probably far more numerically stable. You are correct regarding the binary search if you are going as close to the "inside" as your resolution allows but if you want to render with less detail (i.e. a greater distance estimation threshold) then neglecting to use the binary search (or a weighted search) results in visible "stepping" on the image. Edit: I just went to render an example with and without binary search and discovered to my surprise that the latest version of my own code has almost removed the issue. The problem occurs really noticeably when you use the actual adjacent solid coordinates for computing the normals but in the latest version of my own formula I instead use the DE values from the same distance from the viewpoint as the found pixel on the rays adjacent to the found pixel (i.e. without tracing to the true solid on the adjacent rays) and using this method only has minor stepping even wth a solid threshold as high as 0.1 (note that because I'm using UF I actually get the DE values for the points on the adjacent rays for the rays at the ideal 0.5 pixels offset from the central ray whereas in other implimentations it would probably be more efficient to use the rays at a whole pixel offset). Thank you guys for you replies. Things are starting to make more sense. Also, what are people using to calculate normals? If I define "expansion" it uses the expanded polynomial, but incorrect results. Without "expansion", it uses the trig and it works. Any ideas? Note: This is opencl, which is basically c with vectors. So, a quick preview (I'll post more later this week). I've taken Jan Vlietinck's awesome work on the DX11 Quaternion Julia renderer and I've adapted it for the Mandelbulb. I've got some pretty damn cool results, if I do say so myself, and with pretty amazing performance. 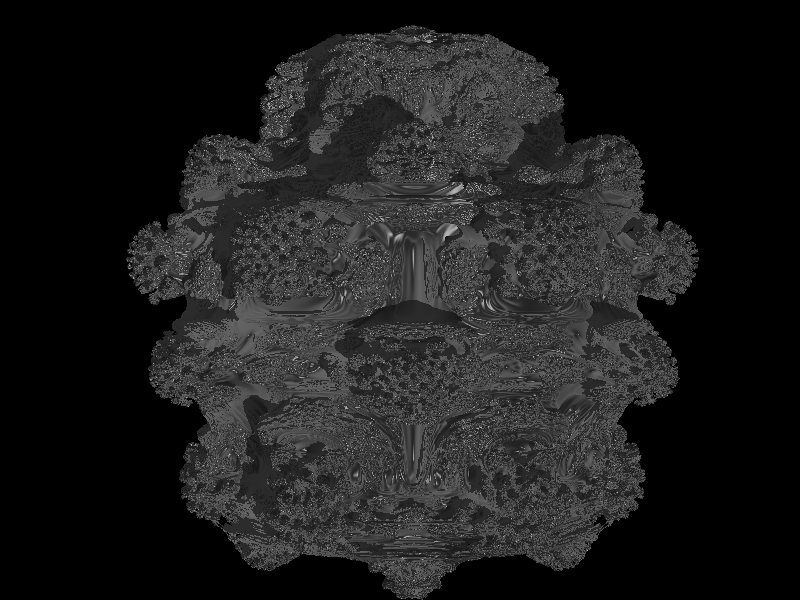 I can now render a 1280x720 Mandelbulb in 14 milliseconds. It's a little rough around the edges (literally), as I'm still tweaking the distance estimator, but I think it's a good start. Done in "a fraction of second" on a ATI Radeon 5850 card. Sorry to awake an old post, just curious wich formula you used on this render Snakehand. No worry fracmonc, I have found what I was looking for! K- Went to your deviantart site- very outstanding pix! I take it most are higher exp M generalizations using mandelbulb or a variation on that. Beautiful structures, and I see in some of them, say, suggestions of similar shapes, in the 2-d details of the 2-power I've been looking at. I'm kinda crawling before I can walk here, with a back-to-basics approach. I'm more interested in the basic math for an extension from the complex plane w.o. sacrificing ANY field properties in the process and believe I have found such! While mandelbulb-type renderings are dazzling and impressive, the math does not seem very straightforward or understandable, at least to me, and while they are a sophisticated expression, they are more a product of what I call M-gymnastics than anything else. I've done many 2-d formulae that would do things like double M bugs, lambdas, tip-to-tips, M-in a circle (what is normally found on Re axis, only mapped to unit circle), etc. That's what I mean by M-gymnastics...anyway, mandelbulb strikes me as more of that, only in 3-d! I'm interested in a straight and simple, meaningful extension of M into more than 2-d on a more basic and fundamental level. Have you read the dialogue I spoke of? I am a keen follower of your (and jehovajah:s) thread, sadly my math skills is some levels lower than yours. Has anyone implemented your new formulas to a good renderer? I would love to play around with them. and yes my images are mostly of the power 8 White/Nylander type. (-sin, sin and cos variations).